Some things, like Cabernet Sauvignon, need time to develop their flavours. Madison feels that way about his first anthology of short stories based on his life in Africa over twenty years ago. We often take years to fully understand intense experiences, and often an experience will only be fully understood in light of later events. I needed the distance that time provided to let these stories crystallize. I also needed physical distance. I found it much easier to write about Africa when I was not there. I missed that country terribly and writing about it was a way of returning. He clearly loved the Dark Continent, so not surprisingly The Moon’s Fireflies is wrapped in nostalgia, and a gentle yearning is diffused into the humour. 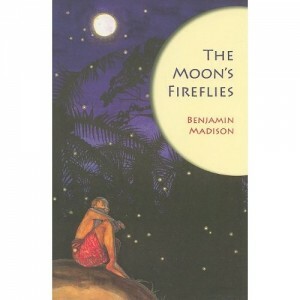 The book’s title, for example, explains how in the local language, Oron, the stars are named after fireflies. In English nta-nta affiang means the moon’s fireflies. This delicious derivation would never be known if he had not been studying Oron, something his colleague, Clifford, feels is a waste of time, as only 50,000 people speak the language. Knowing some of the local tongue, of course, does much more than just fascinate; it opens doors and universally adds smiles to faces. Thus the title captures what is mainly the tone of the book: wonder and delight in the life and people of a remote community. All of this might seem just a tad clichéd, sentimental stuff, if it weren’t for the dark side of the moon. In several stories, readers’ chuckles will suddenly fall off the deep end as the little anthology is balanced with the starker realities of the ‘happy, simple life’. Malaria, for example, is just as common as those fireflies, routinely taking children away. In another story, there is stark and sudden tragedy and murder; the teacher tackles his fear of monsters with his smile and is rewarded, only to realize in the end that the menace he perceived was very real indeed. Trained as an anthropologist, Madison lived in several West African countries for seventeen years, working in education and development. These 16 stories cover his stint as an English teacher in Nigeria at Udong Community School. As a result, they’re time capsules, enclosing a culture and past way of life. To my mind the book was always more of a historical document. Although many Africans still live in villages like those in ‘The Moon’s Fireflies’, one of my motivations for writing these stories was to record some valuable aspects of a world that was rapidly changing. Nowhere is this more apparent than in Affiong. In this story, he’s shackled to an anachronism called ‘Office Studies’, a class where students are learning how to answer imaginary telephones and use old typewriters, unimaginable devices they have never seen in their village! But really all of the stories, set in the present tense, reflect some aspect of that vanished way of life. The tiny Southeastern Nigerian village of Akai Ison is Madison’s setting, cross crossed by footpaths, not roads, and filled with magic and juju (black magic), where travel is mostly on foot or in a 7-metre canoe ‘taxi’, where electricity is non existent and where running water is only in the rivers and streams. I get the feeling these stories have been coddled for years before they had to grow up and expose themselves to the outside world. There’s so much love and longing in between the pages that readers may find their mood suddenly growing mysteriously melancholic. In fact, they were introduced to the public for an unsuccessful short period in 2004, when the Victoria based author published most of them through Trafford Publishing under the title, Night Studies. However, I seriously underestimated the challenges of self-marketing. Very few copies were sold and the book came and went without notice. Then serendipity stepped in. He tracked down an old high school friend whom he hadn’t seen in 40 years, and discovered this friend, Ron Smith, happened to be the publisher of Oolichan Books: Ron read the stories and said he thought they deserved a much broader audience and asked if I would consider letting Oolichan Books publish them. This seemed like a great opportunity for the stories to have a new lease on life with a much larger readership so I happily agreed. Two additional stories were added, and the book was re-edited, but not much, according to Madison. One of my favourite stories is Clifford, where for me he achieves one of his objectives completely, that of counterbalancing the ignorance and arrogance of some of the foreigners who come to ‘help’, with the graciousness and generosity of the villagers. It’s an easy topic to overdo, but in this story he gets away with it totally, largely because of the wry humour that had me chortling. However, it works less well in the final story, Unique Data, where the ignorance of other foreign workers is shown up, but too blatantly and without the gentle irony I’d become accustomed to. He really must have detested this pair. Insofar as these stories are about tolerance, kindness and other social values, I hope they will be relevant not only to today’s readers but to readers 100 years hence, Madison tells me. I hope so too, because this is a book that I will probably keep in my bookcase for a long time. Equally relevant to youth as to adults, it could do worse than wind up in schools. So pour that glass of Cabernet, open the book, and settle down for a mellow evening of pleasant reading.